The simple and accessible guide to living and eating the way nature intended. Deadly Harvest: 326 pp. 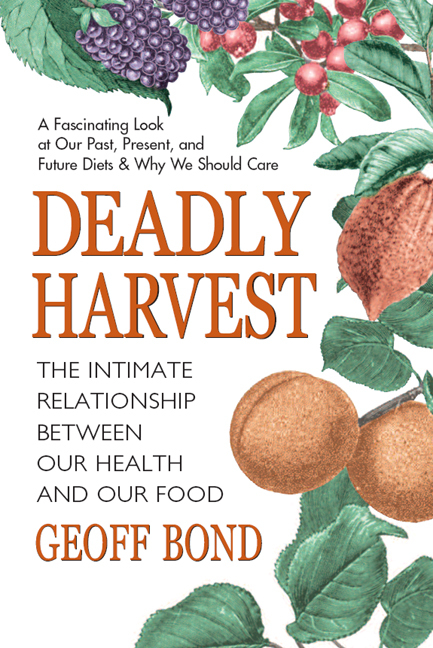 The intimate connection between our food and our health. The flagship publication containing the full story of the why, what and how to feed ourselves and also LIVE as nature intended. Natural Eating: the Introductory Guide. 32 pp. in full color. The easy-to-read essence of the Bond Effect precepts. Originally prepared and distributed to American Standard Inc's 35,000 employees, now suitable for all corporate uses. Healthy Harvest Cookbook: 120pp. Edited with Nicole Bond. Nearly 100 tasty ways of preparing food to conform to the Bond Effect precepts. Download from Geoff Bond's Website. Natural Eating’s Toolbox/Manual. 100pp. The indispensable guide for the serious practitioner containing shopping lists, frequently asked questions, how to organize the day and much more. Download from Geoff Bond's Website. Natural Eating. Nutritional Anthropology: Eating in harmony with our genetic heritage. 240pp. If you want to find out about Geoff’s speaking fees and availability, or if you want more detail on his publications or programs, please contact the speakers’ bureau that referred you to this site.